Even though YouTube isn’t a gaming platform, over half of the audience we’re calling “YouTube Gamers” visit the site on a daily basis. YouTube has become an integral part of many aspects of their lives—and there is more to gamers than you might think. Here’s what your brand needs to know. The gaming industry in Canada has reached the next level. 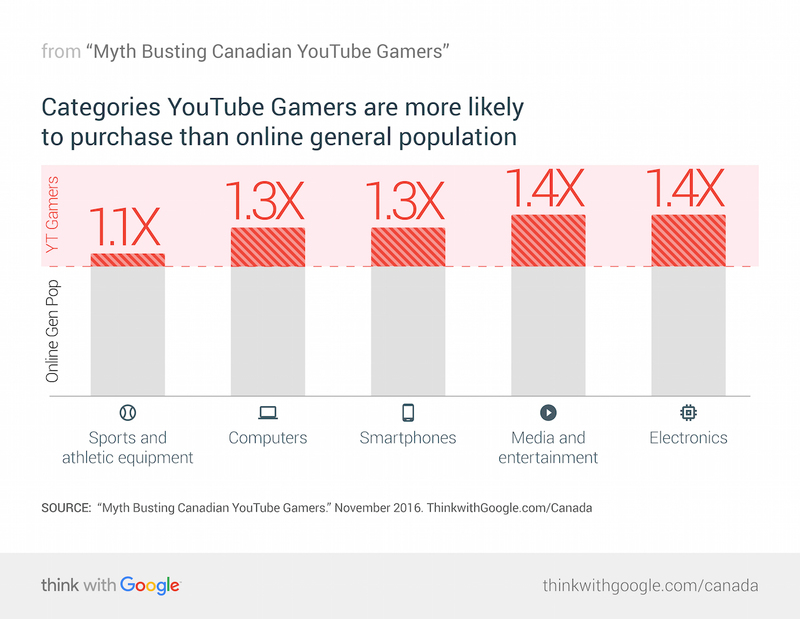 Gamers abound in Canada—and they carry serious purchasing power. 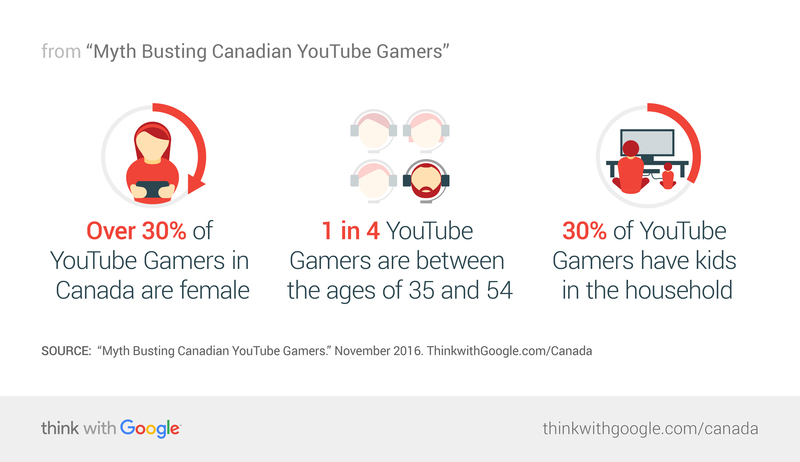 To find out more about them, where they spend their time, and what influences their purchase decisions, we surveyed 4,000 adult online Canadians over the age of 18, 450 of whom turn to YouTube for gaming content. Here, we'll call them "YouTube Gamers." We found that as the gaming industry grows in Canada, so does the diversity of those playing (and watching). Based on this new research, here are four common myths about the audience and what the facts mean for Canadian marketers. As more people across Canada pick up a controller, joystick, or smartphone to win the day, crush the jewels, or find the treasure, they've become a crucial audience for marketers to reach. And understanding what the audience really looks like is paramount. With the growth and availability of new formats (VR), platforms (mobile), and genres of games, there's a game out there for practically everyone. While millennial males are still a strong gaming audience, the industry has evolved to include a wide range of diverse followers. 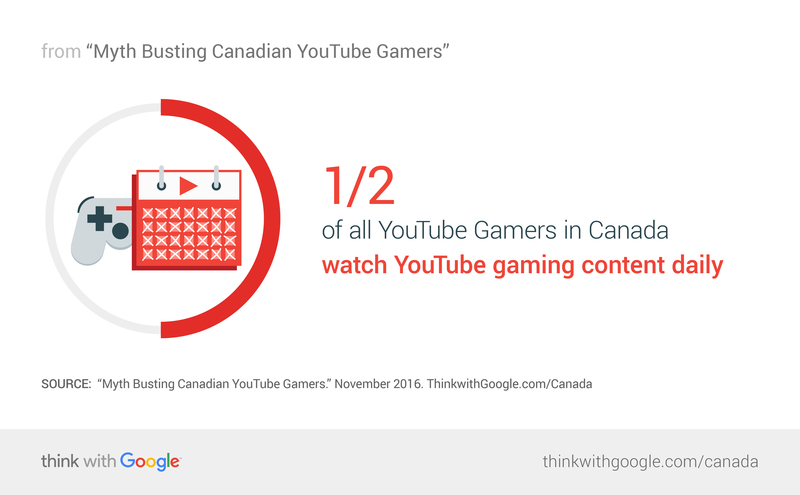 And in Canada, gamers of all types can be found on YouTube. But that's not all they're watching and doing on YouTube. Gamers head to YouTube to stay up to date on their passions and interests. Gamers can be reached through many other genres besides gaming videos. Using in-market and affinity targeting can ensure your brand is present as gamers go to YouTube to laugh at their favourite comedian's stand-up or learn how to cook the perfect steak. Another interesting finding from our research is that YouTube Gamers are more likely than the general online population to purchase products across all kinds of categories. Gamers look to YouTube to help them evaluate and decide on which products to buy. YouTube can help your brand drive awareness and discovery with this valuable audience. Gamers aren't passive viewers or buyers, they're influencers. If they love your products, they can be powerful voices among their spheres of influence. Think about what segments of your brand's target might overlap with the gaming audience and how you might reach them on YouTube. 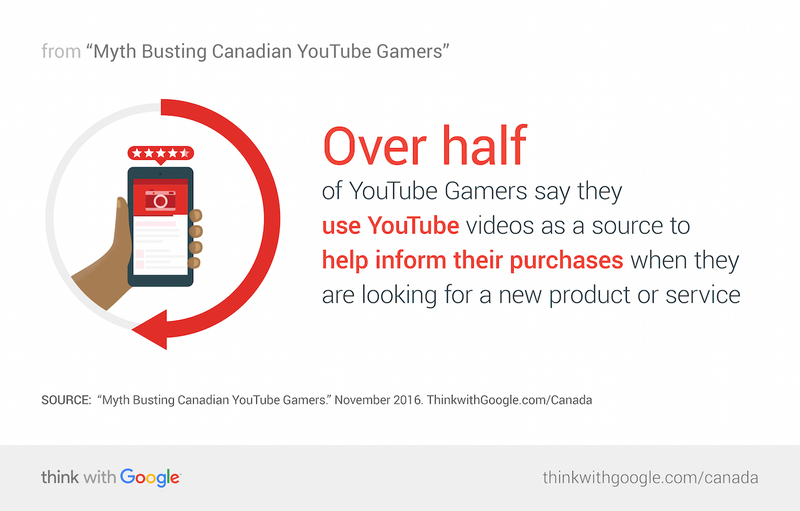 Whether it's through original content from your brand, the Google Preferred Gaming category, sponsorships, or targeted TrueView ads, YouTube has ways to help your brand get the eyeballs, attention, and brand love of these engaged Canadian gamers. We spent the last year conducting extensive research about our YouTube audience garnering insights through qualitative groups in Toronto and Montreal and quantitative research with over 4,000 online Canadians including 450 gamers. 1 Google Search Trends, based on past 12 months since October 2015. 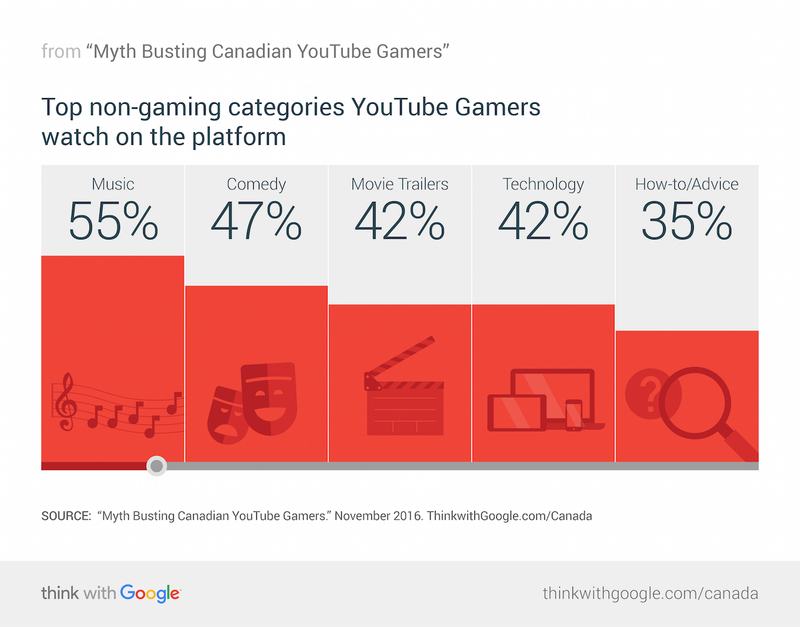 2 Google/Ipsos, "Human Stories Canada," June 2016, n=384 gamers on YouTube.